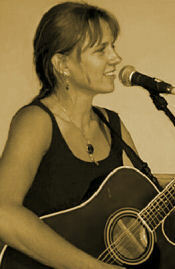 Kim Buchanan, an award winning songwriter, creates an intimacy with her audiences. Through her lyrics and the emotion she conveys with her powerful, yet soulful, vocal abilities, Buchanan's sincerity about the music embraces the listener. Whether performing to a full house on the Kennedy Center's Millennium Stage, or in the intimate setting of a house concert, audiences are guaranteed to receive a magical performance. Buchanan has released 2 Independent CDs with Not Your Mama's Folk Records & 2911 Productions. Illusions, released in the spring of 2002, is a strong follow-up to her nationally recognized debut CD Will I Ever Know? Both discs have received international airplay, and rave reviews. Kim Buchanan is a singer/songwriter from North Carolina who creates intimacy with her music through her evocative abstraction and her rich alto voice. The lyrics on her CD, "Will I Ever Know", emphasize growth and self-discovery. Kim's music derives as much from her connection with Nature's moods and solitude, and much as any external musical influence, which include artists like Sting & Sarah McLachlan. National recognition for her debut CD "Will I Ever Know?" has been on the increase, and she has garnered several awards and a wonderful following on a more regional level. Kim has been joined on-stage since the fall of 1999 by a wonderful percussionist ~ Patrick-jubal Creech (jubal) ~ who adds not only color and texture, but also some incredible & very tasteful rhythms to her heart-felt and observational songs. In July of 2001, Michael Hsu came to "jam" one night, and was recruited to play as many gigs as he could with Kim. Mike's skill as a violinist was beyond anything Kim could have imagined. His addition rounds out the sound with grace and mood Whether watching Kim as she plays solo, or with these talented accomplices, you are insured of receiving a magical performance.